Veggie tacos are a great way to use up lots of produce because you can put almost anything spicy in a tortilla and- voila!- tacos! 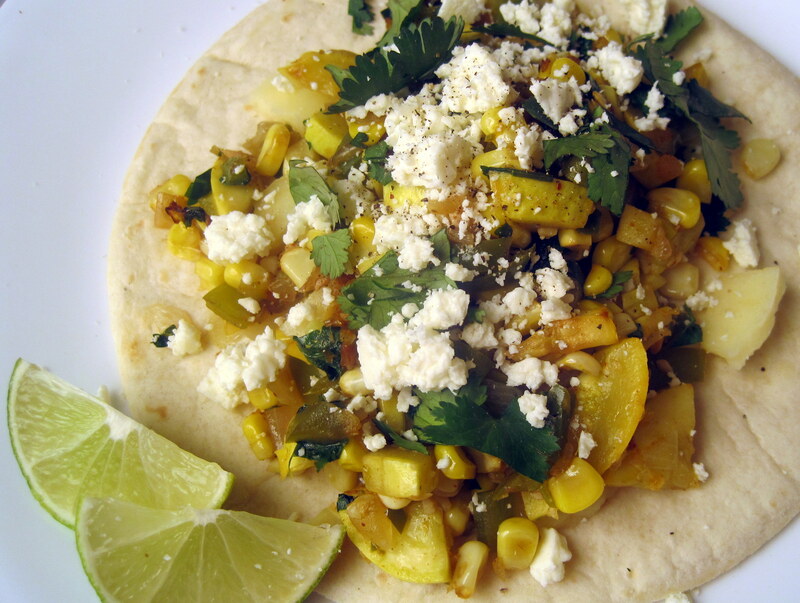 These tacos combine traditional harvest vegetables- sweet corn, summer squash, onions- with spicy peppers, tart lime, and salty Cotija cheese. The squash and peppers in these are straight out of this week’s Greenling Local Box. I had onions and limes on hand from previous deliveries, and the corn was a surprise! Let me explain. The “surprise me!” is an under-publicized item on the Greenling website, and one of my favorite ways to stretch my grocery budget. When you add a $2 “surprise me” item to your shopping cart, Greenling will include a portion of whatever they have extra of that day. Sometimes it’s produce, sometimes eggs, sometimes cheese or other artisan treats. The “surprise me” item is listed in the fruit and vegetable areas of the website, or you can just search for “surprise” and find it that way. Last week I added two “surprise me” items to our Local Box order and I got 2 ears of sweet corn and a few beets. Even though I didn’t plan for those items, it has been easy to fit them into my meal plan and I saved several dollars over the regular price of the produce. Okay, public service announcement over– I hope you enjoy these delicious tacos! Heat olive oil in a large skillet over medium heat. 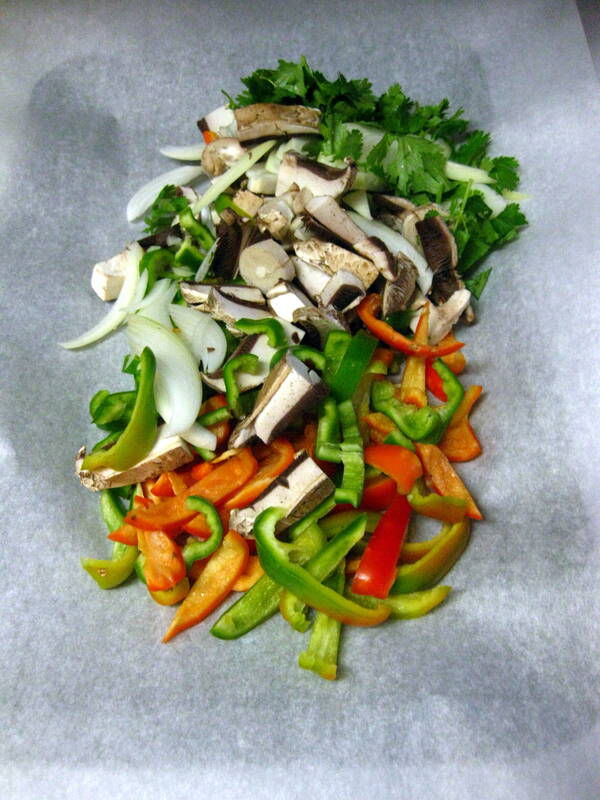 Add onions and peppers; cook until onions are translucent and peppers are soft, about 5 minutes. Stir occasionally. Add corn, squash and dried seasonings, and cook for about 3 minutes, until corn starts to get tender and squash is heated through. (I like the corn to be crunchy!) When veggies have reached desired tenderness, add chopped cilantro to the skillet and stir to distribute. Remove skillet from heat and set aside. For toppings, chop fresh cilantro and jack cheese into chunks. Heat tortillas individually with a little oil in a skillet, or by wrapping the stack of tortillas in a damp paper towel and microwaving for about 10 seconds. 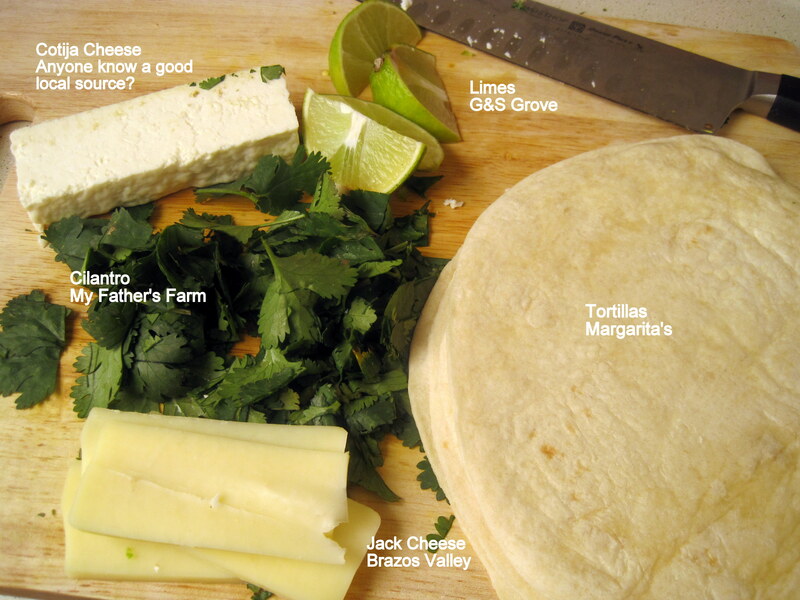 Spoon vegetable filling into warm tortillas and top with jack cheese and cilantro. Crumble a little Cotija cheese over the top, and garnish with a squirt of fresh lime juice. I like to serve these by stacking the tortillas on top of each other and putting the whole mound of toppings on top. I feel a little blasphemous writing about Midwestern chili on a blog titled “The Austin Gastronomist.” Chili is the state dish of Texas after all! Texans are rightly pround of their chili, but we could learn a thing or two from the adventurous Cincinnatians, who traditionally season their chili with cinnamon and cocoa powder. This dish combines those sweet flavors with spicy peppers and smoky chili powder in a thick, hearty stew. Chop onion and, wearing rubber gloves, seed and rib all peppers. Chop the bell peppers and mince the jalapeno and Serrano peppers. Heat oil in a heavy bottomed pot over medium heat and add onions & peppers. Stir occasionally and cook for about 10 minutes, until vegetables are tender and start to caramelize (turn brown in places). Meanwhile, chop meat into bite sized pieces. Add meat to caramelized veggies and cook for about 2 minutes, until meat begins to brown. Add chili powder, paprika, cumin, cocoa powder, cinnamon, allspice, cayenne and salt to the pot, stirring to distribute; then pour in the apple juice and water. Bring liquid to a boil, then turn heat to low. Simmer, covered, for 45 minutes. Before serving, whisk in cornmeal to thicken chili. Plate over mashed sweet potatoes, cornmeal mush, or serve traditional Cincinnatti style over spaghetti. 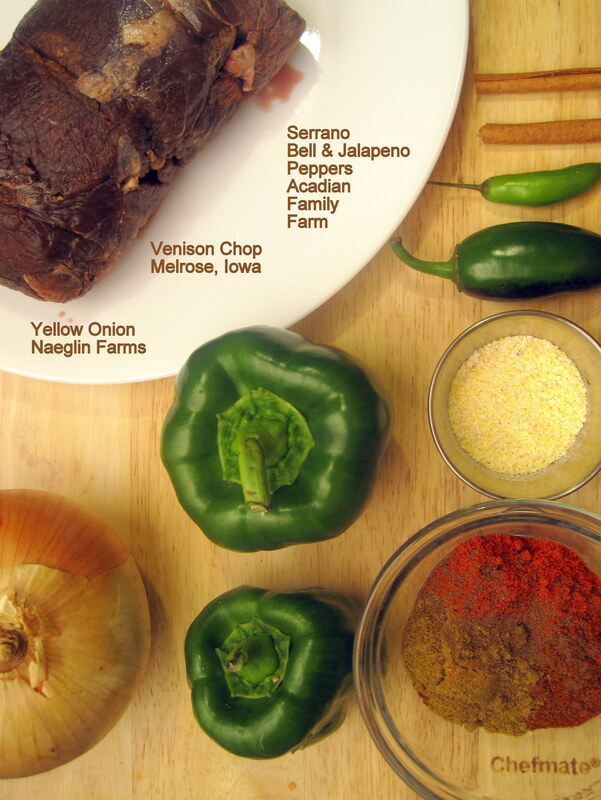 Although this chili was inspired by the Midwest, I stayed true to my Texas roots by serving it over jalapeno cornmeal mush. Next time I make this, I’m planning to take a cue from my friend Hilah and do it vegan by substituting mushrooms and beans for the meat. I made this chili pie in support of the Rangers’ first ever World Series appearance and so far it is working! (We’re winning game one of the series as I type.) The idea for this recipe came from the concession food I liked to eat at Rangers games when I was a kid: frito pie! This healthier, non-processed version combines a spicy chili with hearty jalapeno cheddar corn bread. Pure Texan comfort food! If tomatoes and fresh beans were in season, I probably would have added them to the chili. However, this version will satisfy the most picky Texas Chili enthusiasts since it has neither. 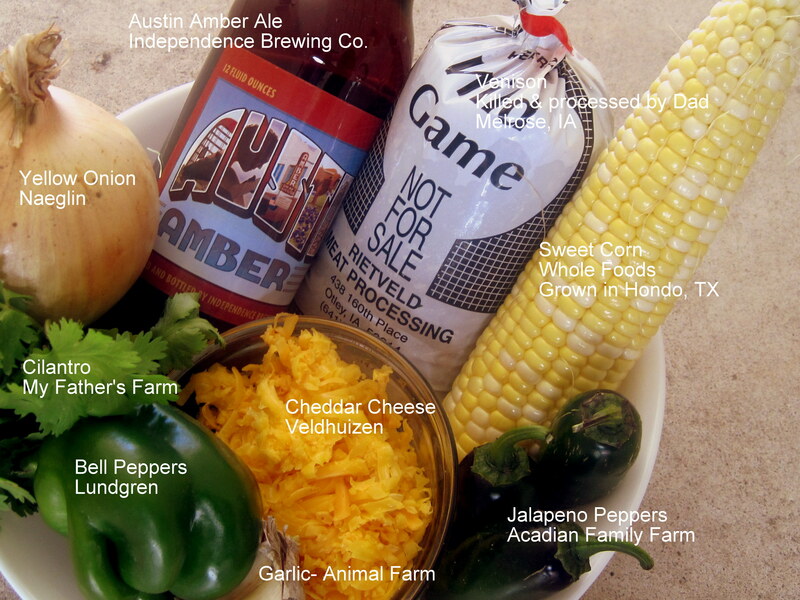 In celebration of Austin Beer Week, I used a whole bottle of Independence Brewing Company’s Austin Amber Ale in the chili, plus a half cup in the cornbread topper. The cornbread also features roasted corn and jalapeno peppers plus local cheddar cheese for added flavor and texture. You could skip those ingredients in a pinch, but the pie wouldn’t be nearly as rich and tasty! I adapted the cornbread recipe from The Beer Wench‘s “Some Like it Hot” cornbread. If you’re interested in gourmet brew, check out her website, it’s very cool. 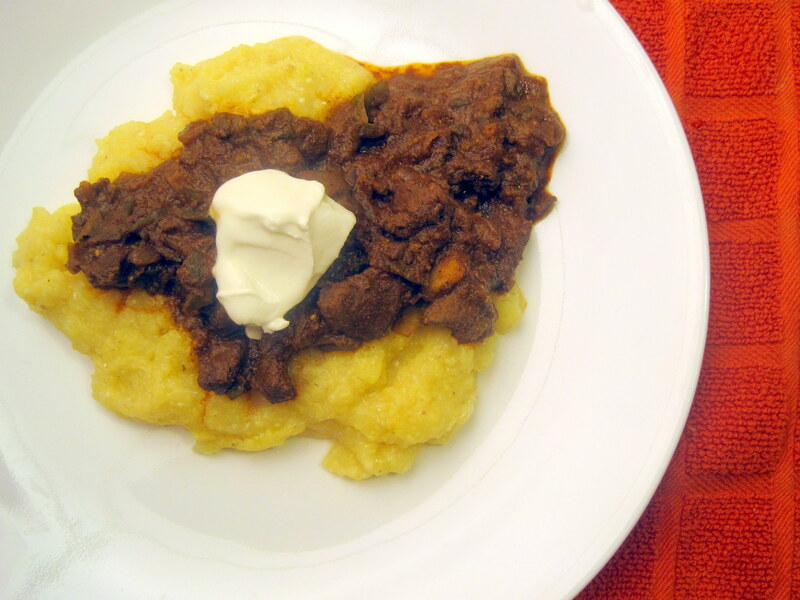 One last thing: both the chili and the cornbread work as stand-alone recipes. However, I think the presentation of the pie is really special. Just like game day food should be! I hope you enjoy this easy and tasty Texas Chili Pie as much as we did, and let’s go Rangers!! In a heavy bottomed pan, brown meat over medium heat, adding a little oil if it’s very lean, stirring occasionally. While meat is browning, chop onions, garlic, peppers, and cilantro and add to pan. Stir the meat mixture and break up any large clumps of meat. Once onions are translucent and meat is broken up, pour in the beer and stir. Add paprika, chili powder, cumin and salt. Allow chili to stew, uncovered, for about half an hour while you prepare the cornbread topping. For the cornbread: First, cut corn off the cob and mince jalapeno pepper. Roast corn and pepper in a skillet over high heat with a little olive oil until some kernels of corn are brown. Set aside to cool. Whisk together flour, cornmeal, salt, sugar, and baking powder in a large mixing bowl. Add milk, beer, and egg and stir until just combined. (Lumps are okay.) Finally, fold in shredded cheese, corn, and peppers. Set aside and preheat the oven to 400 degrees. Back to the chili: stir in cornmeal one tablespoon at a time until chili thickens to desired consistency. After two tablespoons of cornmeal, mine was as thick as juicy taco meat, just how I like it! 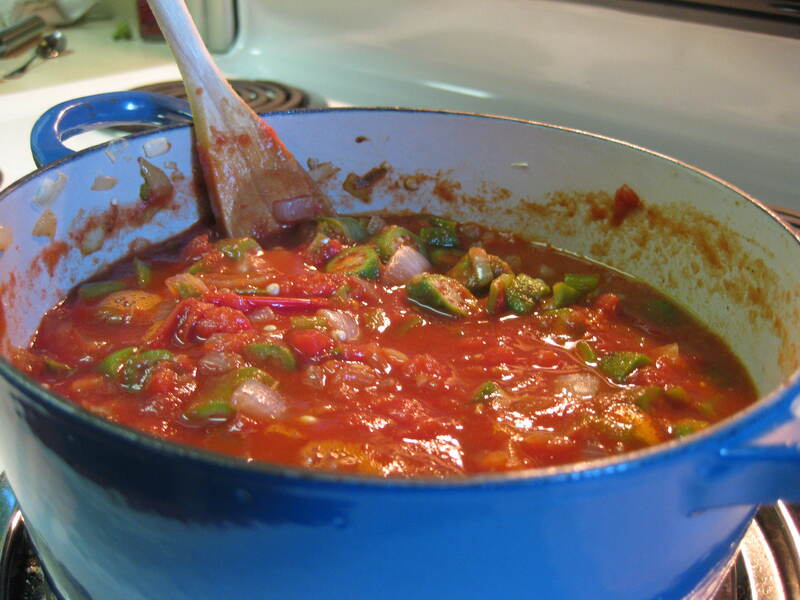 Remove chili from heat and carefully pour it into a 1.5 quart casserole dish. Gently pour cornbread batter on top of the chili. Using potholders, put the casserole in the preheated oven and bake for 30 minutes, until cornbread is golden brown and a toothpick inserted in the middle comes out clean. 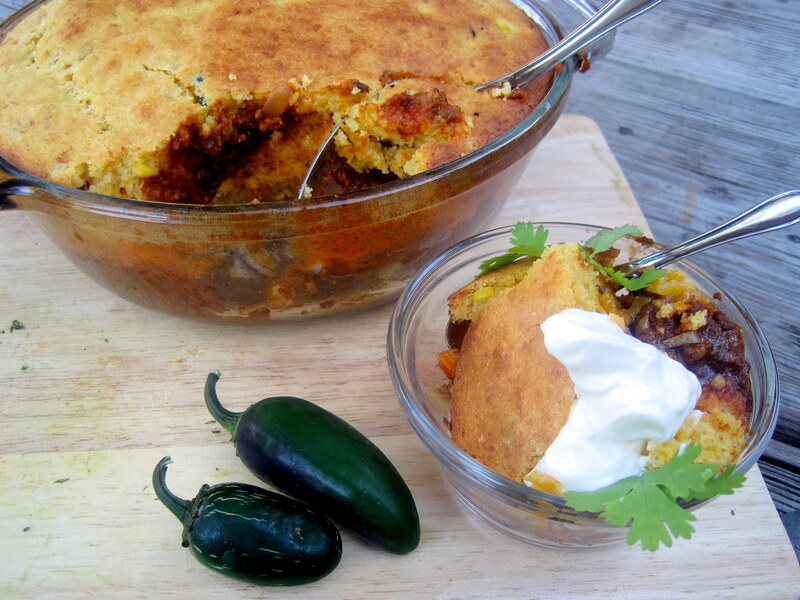 Garnish chili pie with fresh sliced jalapenos, diced onions, sour cream and cilantro. Cheer for the Rangers!! Bhindi (okra, also spelled “bhendi”) is a really popular ingredient in Indian, North African, and Middle Eastern cuisines. 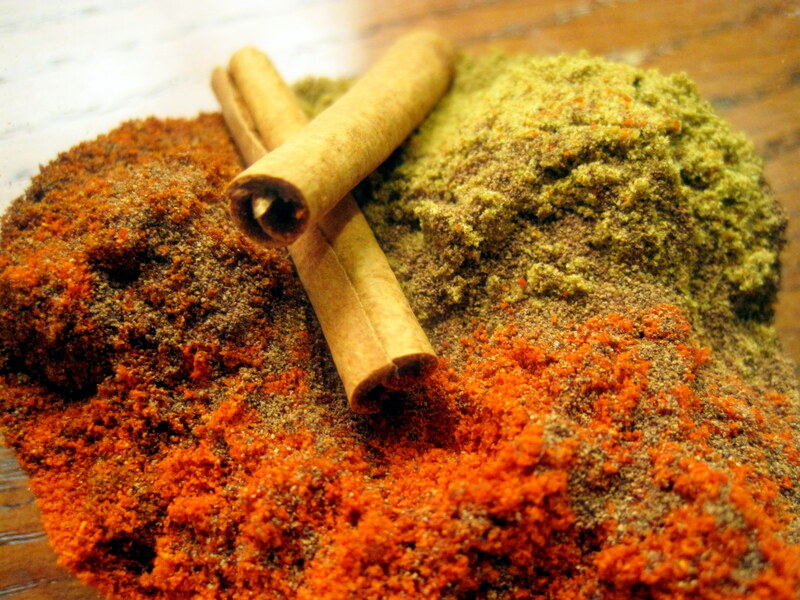 This masala recipe uses basic ingredients most westerners have on hand in their pantries, and it is a nice change from the usual American Southern-style deep fried and gumbo preparations. Full disclosure: I prepared this vegan dish with jasmine rice as a main course for lunch. The flavors were great, but Rami and I were both pretty hungry a few hours after eating. I recommend adding kidney beans, chopped cooked chicken, or tofu to this dish if you want to serve it as an entree. Rinse, dry, and chop the okra. 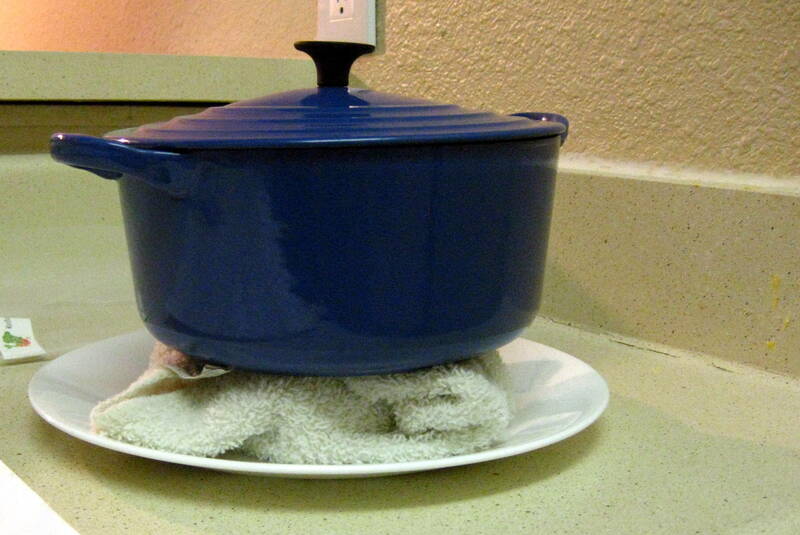 Put a few paper towels on a plate near your work station and then heat oil in a large frying pan. 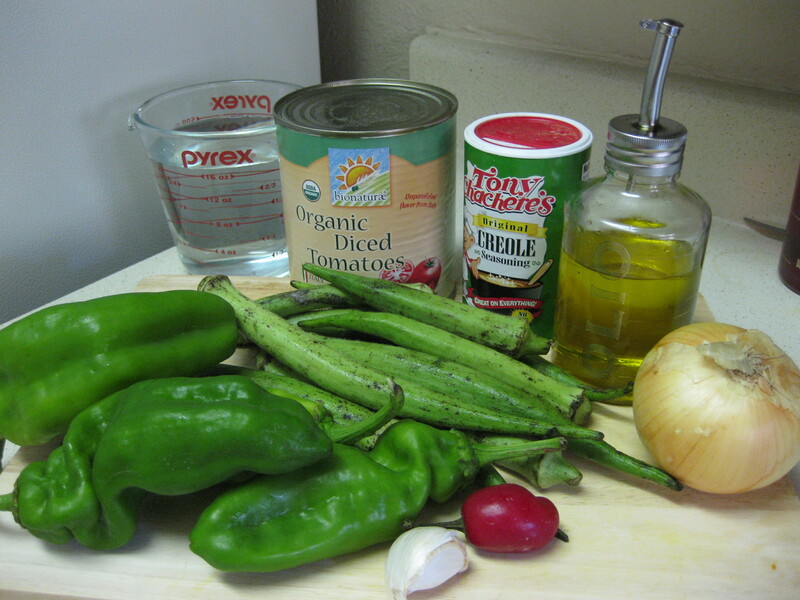 Once oil shimmers, add okra to the pan and cook for 10 minutes, stirring occasionally so that all pieces brown evenly. Meanwhile, prepare other vegetables. 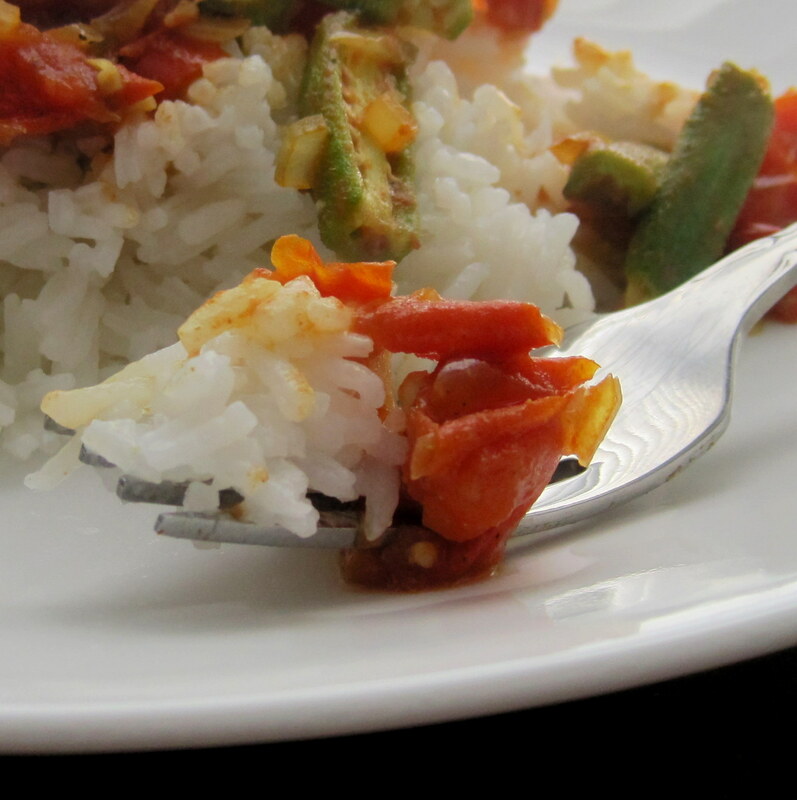 When okra is tender, use a slotted spoon to move it to the paper towel-lined plate. Add onions, garlic, and spices to the oily pan, stirring constantly to prevent sticking. Once garlic is tender, add peppers and continue to stir. Add a little water if needed to keep sufficient moisture in the pan. As peppers become tender, add tomatoes and additional water if needed. Stir and allow to cook for 4-5 minutes. Finally, add okra into mixture. Serve with rice and garnish with fresh cilantro. Tonight’s dinner was one of the best kind: romantic, inexpensive, and no cooking involved. 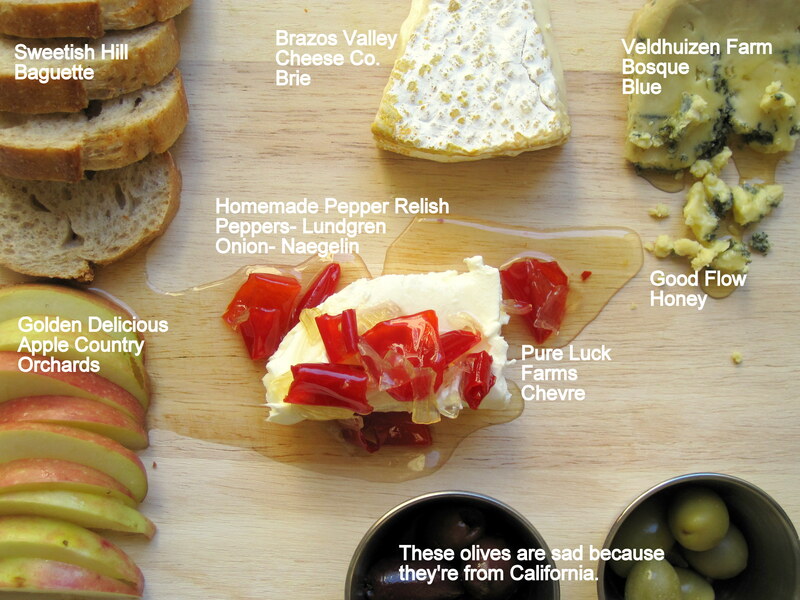 I bought all the ingredients for this cheese plate from Wheatsville Co-op and Greenling, but you can find Texas artisan cheeses and fresh produce at almost any farmers’ market in Austin. The whole presentation was ready from fridge to table in less than 10 minutes, except for the pepper relish which I made the night before. Tip: Wheatsville Co-op will often place very small pieces of local and other sustainably-produced cheeses in a basket together in the cheese cooler. These odds and ends are typically less than $2 each and they’re a great way to try new cheeses and plan a sustainable, ultra romantic date night for under $10. Chop the vegetables and put them in a medium saucepan with the sugar, vinegar and red pepper flakes. Bring mixture to a boil and cook, stirring occasionally, for about 45 minutes. Remove from heat and allow to cool to room temperature. Transfer to an airtight container and refrigerate overnight before serving. 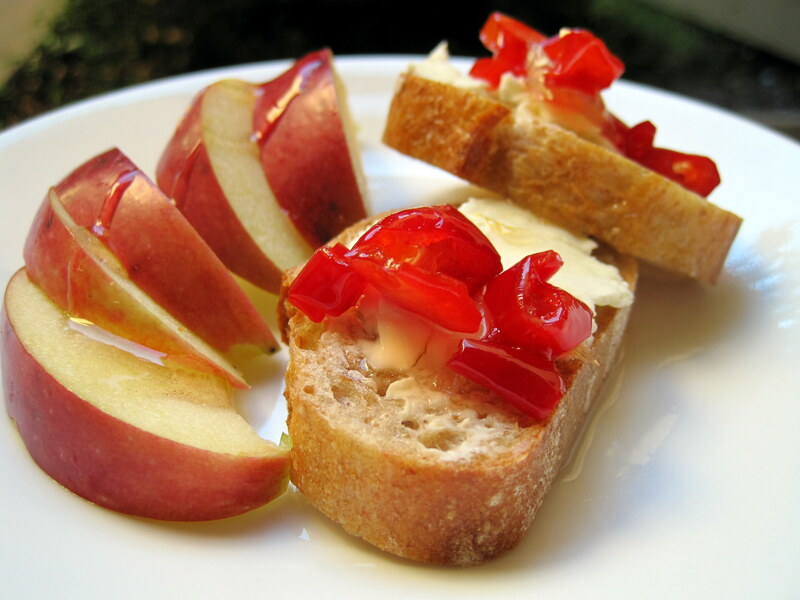 The texture of this relish is not as thick as commercially processed relishes which use cornstarch or corn syrup for consistency. If prepared correctly, the peppers are soft and sweet, and the relish will be about the consistency of pancake syrup. It’s terrific on sandwiches, in tuna salad, and served as a dip over top of cream cheese or chevre. Do you read Weelicious? If not, you should start. Weelicious is one of my favorite food blogs, written by busy model-turned-mom Catherine McCord. Almost every day she posts new, healthy recipes that feature fresh produce. Since the focus of the website is family-friendly food, the recipes are usually very simple to prepare. 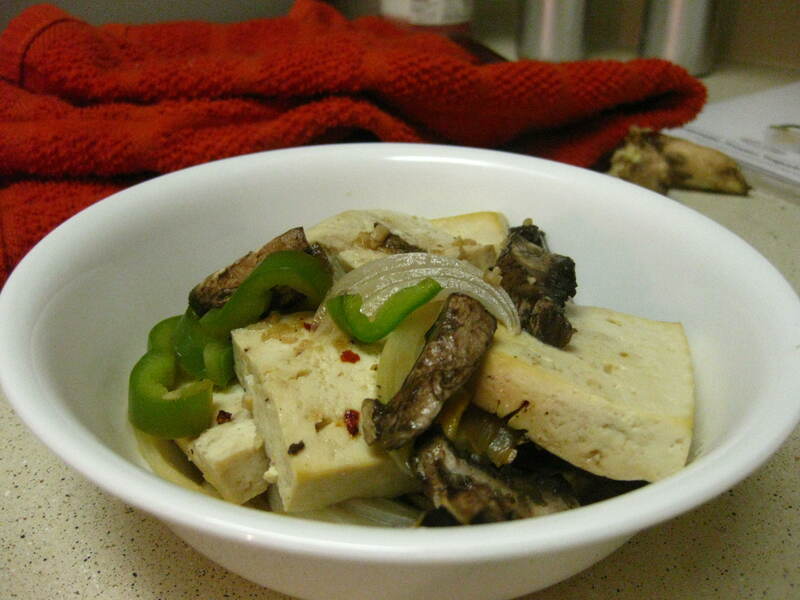 Tofu Packets are a perfect recipe to make use of the peppers, onions, and mushrooms in our local box this week. I adapted Catherine’s recipe to include a few more adult flavors, with a Thai focus. The veggies and tofu are steamed with a spicy Thai inspired sauce inside a “packet” of baking parchment. This low-fat flavorful recipe has replaced WanFu in our rotation of weeknight meals. Preheat oven to 400 degrees. Open tofu and drain off liquid. 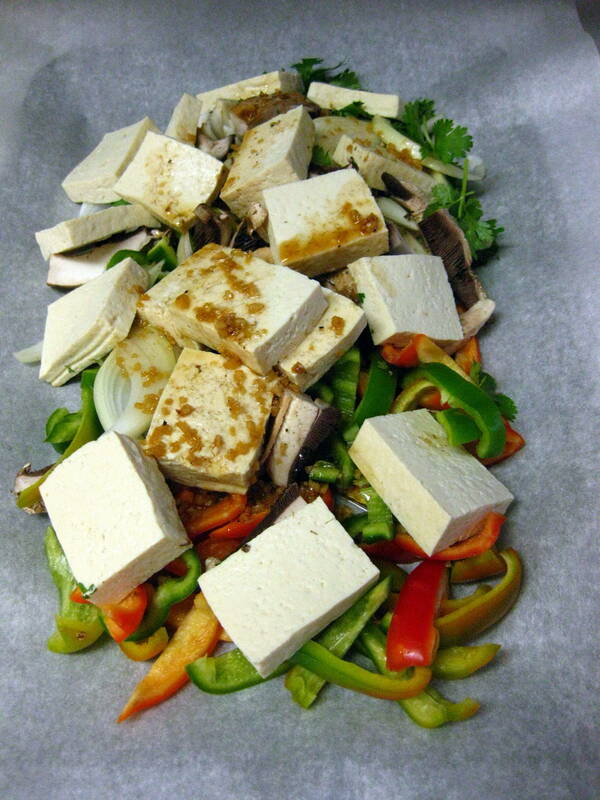 Wrap tofu block in a kitchen towel and place on a plate. Set a heavy pan on top to drain as much liquid as possible from the tofu. Meanwhile, julienne all the veggies. Mince the jalapeno and garlic. 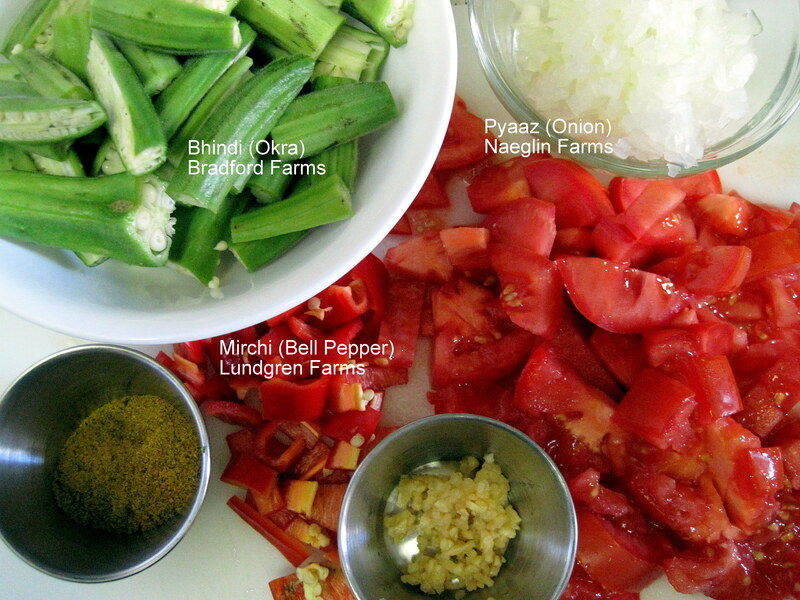 Measure all liquid ingredients in a bowl and stir with garlic and jalapenos to combine. Put a 16 inch piece of baking parchment on a cookie sheet. Mound all veggies in the center of the parchment. Next, remove the tofu from the towel and cut it in fourths. Then cut each fourth into 5 even pieces. Place the tofu on the mound of veggies and pour the liquid over top. If you forgot about the cilantro until now (like me), go ahead and tear about a fourth cup into bite sized pieces over the top. Now we’re going to make the packet. 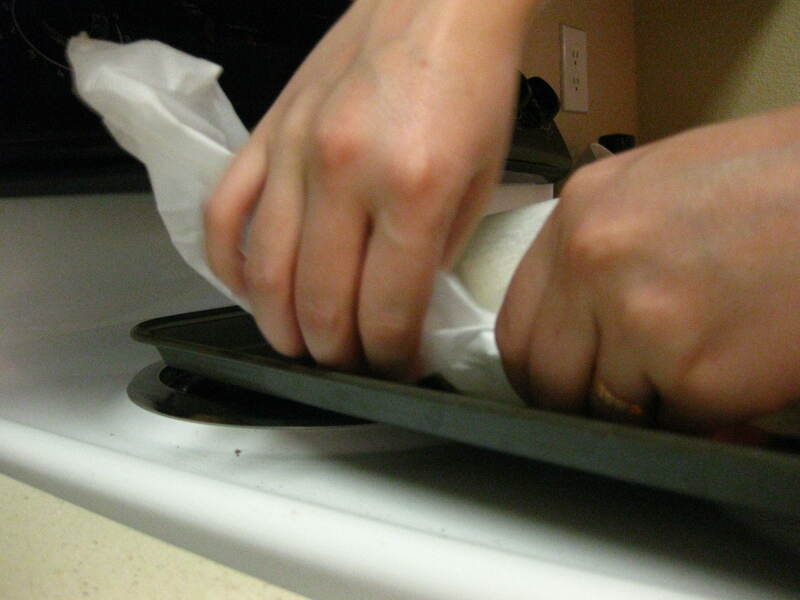 Tear another 16 inch piece of baking parchment and lay it over the top of the first sheet. 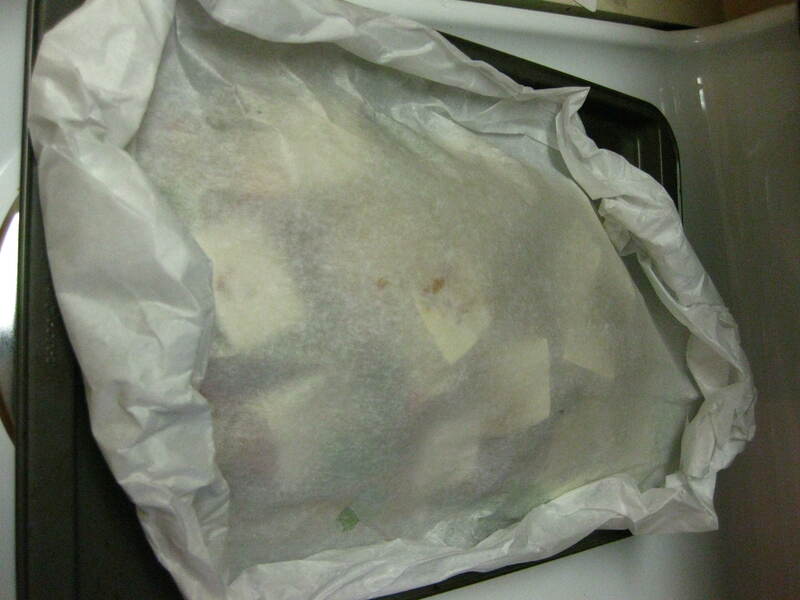 Use your fingers to fold the edges of the parchment paper onto each other, crimping an airtight seal along the perimeter of the mound of veggies. The packet does not need to be pretty. Just crumple the edges together until it’s reasonably airtight. Put the whole shebang in the oven and bake for 20 minutes. Cut open the packet (careful! it is steaming!) and serve with rice or on its own. The best part of this recipe is the cleanup. The cookie sheet should still be clean, so all you’ve got to wash are the serving pieces, one cutting board, and a knife.